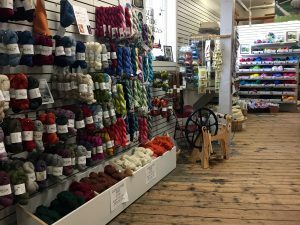 Halcyon Yarn, a yarn and fiber art retail and catalogue store located in Bath, has been in business for over 45 years, serving the needs of weavers, knitters, spinners and other fiber artists. When the founder Halcyon Blake decided it was time to retire, her daughter Gretchen Jaeger sought to buy the business and keep it in the family. Maine SBDC Business Advisor Brad Swanson was asked to participate in the business acquisition project by partner organization Maine Women’s Business Center (WBC). The Women’s Business Center’s Sarah Guerette would assist the mother; Swanson would assist the daughter and her partner, Rachel. Working closely with the women on all aspects of the business plan, Swanson helped them think through the management of their business and the implications and costs of the changes that the women would make upon acquiring the business, and project the sales goals related to their new marketing strategies. With a complete set of financials and corresponding business plan, the women secured a new line of credit for $75,000 from their local bank, and acquired assets worth $292,000. They retained 17 jobs and created 1 new job. The transition in ownership went well and the women are energized and excited about the opportunity to grow this business. Since the transition, the business has increased their selection of regionally produced items, and launched a wholesale division that is now conducting sales in five countries.